Before leaving for recess last week, congressional Republicans introduced a bill that would make it more difficult for workers to form a union and collectively bargain. The misleadingly named Employee Rights Act has been introduced in prior Congresses as well. The legislation would strip workers of many rights under the National Labor Relations Act (NLRA). For example, it would prohibit voluntary employer recognition of a union. (Under existing law, an employer is free to recognize a union and bargain with its workforce when workers show majority support for the union.) The bill also reinstitutes unnecessary delay in the union election process, mandating that parties litigate issues likely to be resolved in the election. Perhaps most ridiculous is the bill’s requirement that a union win the support of the majority of all workers eligible to vote in the union election—not just those workers who vote. Imagine if the bill’s sponsor, Congressman Phil Roe (R–Tenn. ), had had the same requirement in his own election. He would have lost, and so would all of his Republican colleagues who cosponsored the bill. * US citizens, ages 18 and up are considered eligible voters (see Citizen Voting Age Population from the American Community Survey). 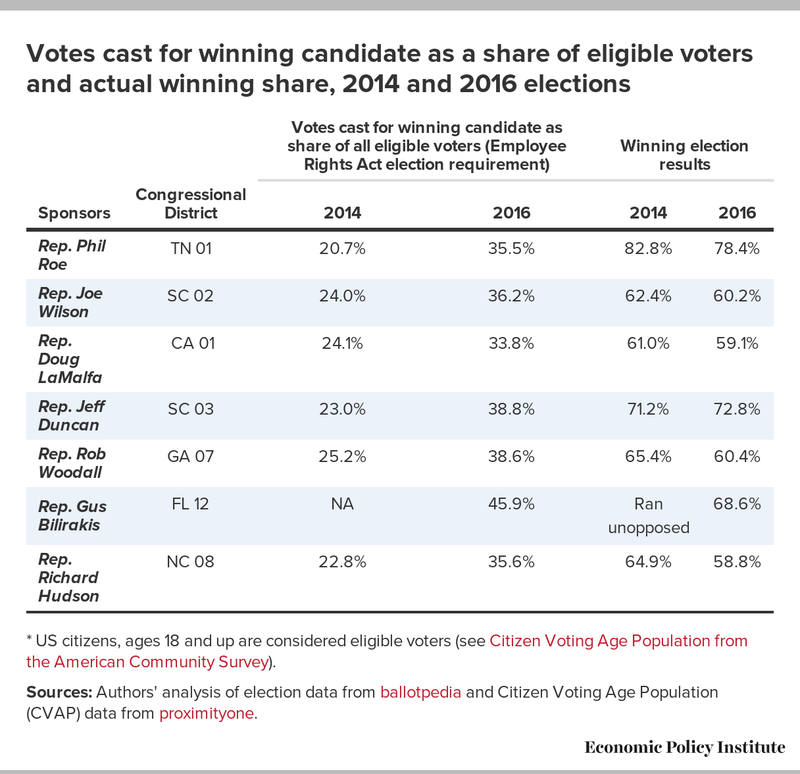 Sources: Authors' analysis of election data from ballotpedia and Citizen Voting Age Population (CVAP) data from proximityone. The Employee Rights Act is a clear example of Republican contempt for workers’ rights to organize and bargain collectively. The legislation rigs the union election system, instituting standards for unions that no elected official could survive. On the same day that Rep. Roe and his colleagues introduced their anti-worker legislation, Democrats introduced a bill to raise the minimum wage to $15 by 2024. The proposal would lift pay for 41 million workers—nearly 30 percent of the U.S. workforce. Raising the minimum wage to $15 per hour would begin to reverse decades of growing pay inequality. The stark difference in these measures is revealing. While both parties attempt to message their legislative agenda as pro-worker, the substance of their proposals could not be more different. Workers deserve policymakers who will work to shift power back to working people by strengthening their rights to organize and collectively bargain for better wages and benefits not advance legislation that makes it impossible for them to do so.